When last we left our hobbit and his merry dwarf boy band, they’d just finally found the secret door into the Lonely Mountain! And we know what this means, yes we do, my precious: SMAUG. Let’s get right down to the dragon-y goodness, shall we? There it is: dwarves are not heroes, but calculating folk with a great idea of the value of money; some are tricky and treacherous and pretty bad lots; some are not, but are decent enough people like Thorin and Company, if you don’t expect too much. Stereotypical, much? Also rather racist, even aside from any question of whether Tolkien took inspiration for the dwarves from real-life Jews. It’s disappointing to see the same author providing us a heroic figure from the hobbits unilaterally dismissing another of his races as being able to engage in heroic actions, and it doesn’t help to get that half-assed addendum of Thorin’s company being “decent enough people”. He was trembling with fear, but his little face was set and grim. Already he was a very different hobbit from the one that had run out without a pocket-handkerchief from Bag-End long ago. He had not had a pocket-handkerchief for ages. And he’s still not quite over the habit of whinging to himself. But again, at least, whinging to himself, and he is in fact heading down the tunnel. So go you, Bilbo! There he lay, a vast red-golden dragon, fast asleep; a thrumming came from his jaws and nostrils, and wisps of smoke, but his fires were low in slumber. Beneath him, under all his lumbs and his huge coiled tail, and about him on all sides stretching away across the unseen floors, lay countless piles of precious things, gold wrought and unwrought, gems and jewels, and silver red-stained in the ruddy light. And the scramble to recover Bofur and Bombur from further down the mountain while Smaug has taken to the air in rage… oh yeah, lovely tension in those paragraphs, too. This should make for exciting shots in the next movie, that’s for sure! And hee hee hee “you have nice manners for a thief and a liar”. Many lovely lines here in the exchange between Bilbo and Smaug, and I can’t wait to hear Martin Freeman and Benedict Cumberbatch bandying this dialogue back and forth. Also, I totally envision him scampering back up the corridor going “woo woo woo woo!” just like Curly in the Three Stooges, or Zoidberg in Futurama! The chapter ends with Smaug deciding to assault Lake-town, since he’s half-certain that the unseen thief has come to the Mountain with their support. When Thorin pontificates about it being time for Bilbo to step up to the plate, the French translator clarifies this a bit, thus: “Maintenant est venu le moment d’intervenir pour notre estimé M. Baggins…” Which is more or less “Now is come the moment to intervene for our esteemed M. Baggins…” Compare to “Now is the time for our esteemed Mr. Baggins…” in the original. While Thorin’s in pontificate mode, we get a verb that’s recently come up for me in SuperMemo, i.e., “ressentir”: “… mais Bilbo ressentit quelque impatience.” (“But Bilbo felt some impatience” is the direct translation of that, though the original is “But Bilbo felt impatient.”) And looking it up online tells me that the English verb “resent” is in fact related to “ressentir”. The general impression I have of the French verb, though, is that it’s just general “feeling”, as opposed to “negative feeling”. I didn’t catch this going through the English chapter, but Bilbo does throw off the phrase “third time pays for all”. I wonder if this is related to “third time’s the charm”? In French, it’s rendered as “la troisième fois rapporte pour toutes”, and if I understand “rapporter” correctly, it’s “bring back/return”. The description of how Bilbo wasn’t expecting a chorus of volunteers (“un chœur de volontaires”) and therefore was not disappointed gives us “déçu”, the past participle of “décevoir”, “to disappoint”. Another interesting verb just for its similar to the English “deceive”, though it’s not clear to me whether that definition also applies to “décevoir”. French.about.com thinks not, and neither does dictionary.reverso.net. Google Translate however offers it as a possible definition. Ha! The description of Fili and Kili looking embarrassed when Bilbo asks the dwarves who’s going into the tunnel with him gives me a vocabulary word I recognize from a song: “gêné”! This means “embarrassed”, and I know it from the song “Quand on est gêné”, one of the more charming songs off my copy of Éric and Simon Beaudry’s album “Le sort des amoureux”. The context in which it appears is thus: “Fili et Kili se tenaient sur une jambe, l’air gêné…” And yeah, I am totally seeing the dwarves from the movie looking sheepish here. “En catimini”, as observed in previous chapters, appears again here. Noting it again for meaning “on the sly”, and because I like the sound of it! Here’s a nice crunchy word that appears when Balin’s refusing to go down the tunnel any further with Bilbo: “chuchotaient”, “whispering”. Imperfect tense of “chuchoter”, “to whisper”. This bit has a lovely rhythm to it: “il descendit, descendit, descendit silencieusement dans le noir.” Compare to Tolkien’s original “he crept noiselessly down, down, down into the dark”. Good job on capturing the cadences there, translator! And here’s Bilbo looking all grim-like in French: “Il tremblait de peur, mais son petit visage était rigide et sévère.” Somehow this makes Bilbo come across as even tinier and more adorable. “The least Tookish part of him” comes across a little more strident in French, too: “s’écria son côté le moins Took”. This translates to “cried the least Tookish side of him”, if I read it right. Ooh, new verb: “vrombir”, which means “to hum/to whirr/to roar”. It appears here: “Un son commença aussi à vrombir à ses oreilles”. Dictionary.com doesn’t think “vrombir” is related to the English “vroom”, but one does wonder whether the onomatopoeia independently developed here. The noise Bilbo begins to hear of Smaug in his sleep is described in French thusly: “une sorte de bouillonnement semblable au bruit d’une grande marmite sur le feu, mêlé d’un grondement qui faisait penser au ronronnement de quelque gigantesque matou.” What Tolkien actually wrote was: “a sort of bubbling like the noise of a large pot galloping on the fire, mixed with a rumble as of a gigantic tom-cat purring.” But I like the description a bit more in French, just for the words “bouillonnement” (bubbling) and “ronronnement” (purring). And the word “matou” (tomcat) is new to me, too. 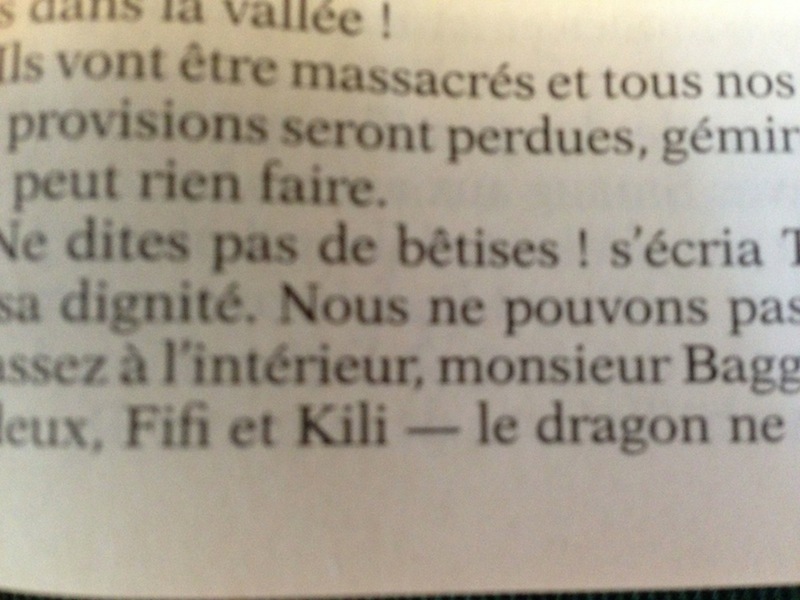 “Il était étendu là, le grand dragon rouge doré, profondément endormi…” (“He lay there, the great red golden dragon, sound asleep…”) Yeah, rather shiver-enducing in French, too. This is a good word: “éblouissement”. It means “dazzlement”, as near as I can tell, though Tolkien used “staggerment” to describe Bilbo’s reaction to Smaug’s hoard. Interesting as well to see this word and the ones I mentioned above used as nouns, rather than adverbs; it’s important to note that words that end in -ment, in French, can be either. “Au voleur ! Au feu ! Au meurtre !”–this is Smaug waking to discover the cup has been stolen. It interests me that “Thieves! Fire! Murder” takes on “au” in the French, here. “Aiguillonnés”–this means “roused” or “spurred”, and it appears where Bilbo is urging the dwarves to take shelter behind the door of the tunnel once Smaug takes to the air in his rage. Good word. BWAHAHAHA! I just found a typo! Here’s a bit I understood more or less straight through: “Girion, Seigneur de Dale, est mort, et j’ai mangé ses gens comme un loup parmi les moutons, et où sont les fils de ses fils qui oseraient m’approcher ?” (“Girion, Lord of Dale, is dead, and I have eaten his people like a wolf among the sheep, and where are the sons of his sons who dare approach me?”) Smaug does, I admit, make a valid point here about his awesomeness. And here he of course winds up to the big finish in the middle of that same pontification: “Mon armure vaut dix boucliers, mes crocs sont des épées, mes griffes des lances, le choc de ma queue est semblable à la foudre, mes ailes à un ouragan et mon souffle est mortel !” (“My armor is worth ten shields, my teeth are swords, my claws spears, the shock of my tail is like lightning, my wings a hurricane and my breath is deadly!” Pretty close translation to what Tolkien actually wrote.) Sounds even more pompous in French, though I can’t help but snicker at those last few words. This is “souffle”, NOT “soufflé”, but I still can’t help but read this as “MY SOUFFLÉ IS DEADLY!” Don’t let Smaug in your kitchen, people. For your own safety. Bilbo’s last shot at Smaug gives us the phrase “en flèche du Parthe”, which is more or less the translation of “a parting shot”. The amusing part of this, though, is that there’s a different phrase, “Parthian shot”–and the French actually appears to be a translation of that! According to this Wikipedia article, “parting shot” and “Parthian shot” developed separately, even though they mean more or less the same thing. And this article on the French wiktionary site more or less says the same, if I understand it correctly. Very cool. The Arkenstone is of course referred to as “L’Arkenstone”–and oh hey, is this really actually the first reference to the Arkenstone in the entire text? It does seem to be, based on my search of my ebook of the English edition! Noting “L’Arkenstone” here though since it did appear in the movie, and it did in fact get referred to as “L’Arkenstone” in the movie’s French language track! More bits I understood more or less straight, where Bilbo begs the dwarves to shut the door before Smaug fries them all: “Fermez la porte ! 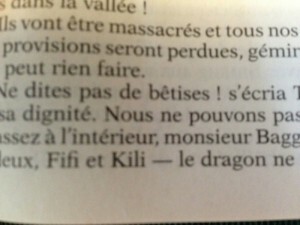 Je crains ce dragon jusqu’à la moelle de mes os. Je déteste encore bien plus ce silence que tout la vacarme d’hier soir. Fermez la porte avant qu’il ne soit trop tard !” (“Close the door! I fear that dragon to the marrow of my bones. I hate the silence even more than all the noise of last night. Close the door before it’s too late!”) The only bit of this I didn’t more or less recognize was the word “vacarme”, which is “noise/din/racket”. “Jetzt ist die Zeit gekommen…” This is “Now the time has come”, a bit that I actually understood. Bilbo crossly calls Thorin “o Thorin Thrainssohn Eichenschild” in the German edition, hich has a neat rhythm to it. And “Thrainssohn” looks rather Nordic, which is rather generally fitting for Tolkien, I expect. Here’s another bit that has nice rhythm to it: “unserem ursprünglichen Vertrag”, which means “our original contract”. I quite like the word “ursprünglichen”. This sentence has another good crunchy word in it: “Er meinte den vergangen Frühling, ehe er sein Haus verließ; doch das schien ihm Jahrhunderte zurückzuliegen.” (“He meant the previous spring, before he left his house; but that seemed to him to lie centuries back.”) How’s “züruckzuliegen” for crunchiness? Two z’s AND an umlaut. I had to break this one down into compononent words to get “to lie back”, though. Another one: “Gewissensbisse”, “remorse”. What Fili and Kili look like they’re having when Bilbo pointedly asks the company who’s coming into the tunnel with him, and nobody volunteers except Balin. “Now you are in for it at last, Bilbo Baggins,” he said to himself. “You went and put your foot right in it that night of the party, and now you have got to pull it out and pay for it! Dear me, what a fool I was and am!” said the least Tookish part of him. Jetzt bist du ganz und gar hineingerasselt, Bilbo Beutlin, sagte er zu sich selbst. Du hast dich damals in der Nacht, als die Gesellschaft bei dir zusammenkam, auf dieses Abenteuer eingelassen, und nun sieh zu, wie du wieder herauskommst. Du liebe Zeit! Für so viel Dummheit muss man bestraft werden! So sagte diejenige Seite in ihm, die mit den Tuks am wenigsten zu schaffen hatte. So let me see if I can break this down. “Hineingerasselt” if I’m parsing it right seems to be a conjugation of a legitimate verb, “hineinrasseln”, but damned if I can figure out what it actually means aside from a vague guess that it more or less means what Tolkien wrote, i.e., that Bilbo is “in for it”. The notion of Bilbo putting his foot in it and having to pull it back out and pay for it comes out completely differently, too. If I’m translating this right, Bilbo’s more or less saying he was in for it the night the company convened for the adventure, and now they’re watching him pull out of it again… maybe? This is a big enough chunk of German that it’s kind of beyond me, and I’m doing well to realize that it doesn’t really match up with what Tolkien wrote, I think. It’s more obvious though that German!Bilbo is lamenting that “for such stupidity one must be punished”, whereas English!Bilbo’s just ragging on himself for being a fool. Not quite the same thing. Ooh, I like this word, though: “drachengehüteten”. Dragon-kept? Dragon-guarded? It’s used with “Schätzen”, in the general sense of “dragon-guarded treasures”, in which Bilbo is firmly telling himself he has no interest. Auch drang ein Geräusch in seine Ohren, eine Art Blubbern, wie von einem riesigen Topf, der auf einem Feuer rüttelte. Und dazwischen rumorte es wie das Schnurren eines gigantischen Katers. “Blubbern” amuses me; it’s “bubbling”, though of course it looks like the English word “blubber”. Which gives an entirely different connotation to the noises Smaug is making! Dictionary.com says the English word is related to the German word, but it’s less certain about the English word “bubble”. First contender for Longest Word in the Chapter: “unmissverständlichen”, which took up a good half of an entire line of print all by itself. It apparently means “unequivocal”. 21 total characters. Second contender for Longest Word in the Chapter: “zusammengefalteten”, which means “collapsed”! But only 18 characters! I’m seeing a lot of extra paragraph breaks in this chapter, even more so than usual–possibly because the narrative does periodically jump back and forth between Bilbo’s POV and that of Smaug. The translator’s breaking pretty much any time this happens. Which does help if you’re used to breaks between POV switches, but it also definitely changes the flow of things somewhat. And here’s Smaug’s opening line to Bilbo: “Dieb! Ich rieche dich, ich spüre deinen Luftzug. Ich höre deinen Atem. Komm! Bedien dich, hier ist genug!” (“Thief! I smell you, I feel your draft. I hear your breath. Come! Help yourself, here is enough!”) A bit more literal than what Tolkien actually wrote, but still gets the point across. Bilbo calls Smaug “Fürchterlicher” out of the gate, which Google Translate thinks is “Hideous”, but I’m not sure I buy that. Tolkien’s original word there is “Tremendous”. Googling around a bit gives me more the idea of “terrible/awful”, though hrmm, I suppose “hideous” works there too. It’s a tonal shift from the English, definitely. Ooh, important and interesting note: Bilbo is addressing Smaug as _du_, not as _Sie_. The translator’s choosing a different course of action here than the French one did! “Chiefest and greatest of calamities” becomes “größtes und schrecklichstes aller Unglücke”. Which is neat to read but hard to say! 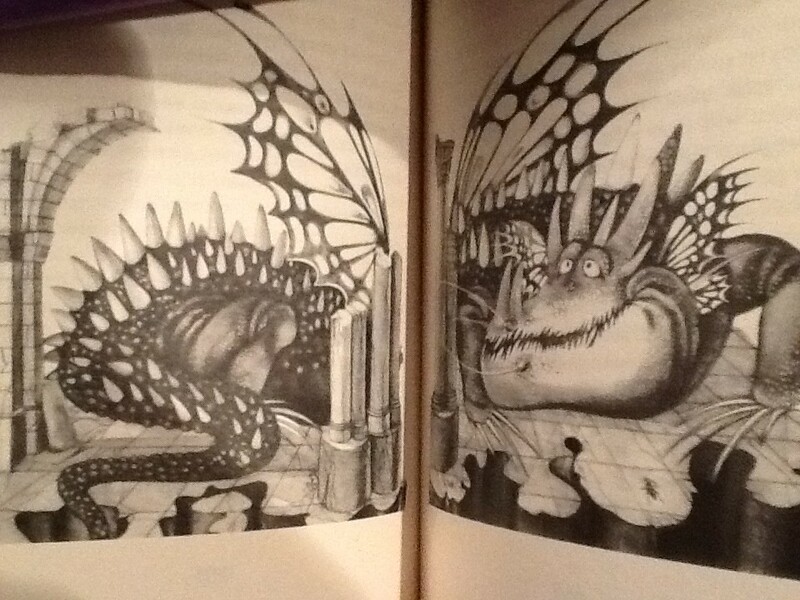 And OMG you guys, behold this pic of how Smaug was drawn in the illustrations! THIS is supposed to be the destroyer of Dale? The bane of the Lonely Mountain? The aforementioned Chiefest and Greatest of Calamities? Somehow I can’t really see Benedict Cumberbatch voicing this critter. And yet, he’s oddly adorable! I really want to skitch him on his big ol’ chin and tell him WHOSSA BIG FIERCE DRAGGIN YES YOU ARE. Some of Bilbo’s self-appointed titles in German: “der Spurfinder” (track finder? ), “der Netzschlitzer” (web slicer), “die stechende Fliege” (the stinging fly). And of course, “Ringfinder”, which is self-evident, and “Glücksträger” (luck carrier). I actually understood this tiny bit, woo: “Laut lachte Smaug”. (“Loud laughed Smaug.”) Which is a bit of a scary image, when you think about it, something as big as a dragon laughing. Smaug’s defiance of Girion is thus: “Girion, Fürst auf Dal, ist tot. Und wie ein Wolf unter den Schafen habe ich sein Volk gefressen. Wo sind seine Enkelsöhne, die es wagen, mir zu nahen?” Pretty much a straight translation, though I observe that the German translator broke the original English sentence up a bit. And this is Smaug’s enumeration of his various mighty attributes, as described above: “Meine Rüstung ist ein zehnfacher Schild, meine Zähne sind Schwerter, meine Klauen Speere, das Aufschlagen meines Schwanzes ist ein Donnerkeil, meine Schwingen sind Wirbelstürme und mein Atem bringt den Tod!” Again, pretty much straight-up translation, give or take a few words! Bilbo calls Smaug “du Undurchdringlicher”, “the Impenetrable”, when he gets a look at his armored underbelly. Interesting–the German translator actually uses two words for the Arkenstone, “Der Arkenjuwel” and “Der Arkenstein”. Bilbo’s begging the dwarves to close the door: “Schließt die Tür! Ich fürchte diesen Drachen bis ins Mark. Die Stille gefällt mir viel weniger als der Aufruhr in der letzten Nacht. Schließt die Tür, ehe es zu spät ist!” I like “Aufruhr” as a word–“uproar”. And I note with interest that the translator uses “I fear this dragon to the core” rather than the notion of “to the marrow of my bones”. And on that note, with Smaug heading off to raze Lake-town, we end Chapter 12!